For Cheryl- Thank you for reminding me. Much love. It’s hard to do, but for my own self interest, I’m doing it. Throughout my life there’s been all sorts of people and experiences of which I’ve had to learn to gracefully let go, to bind the emotion to a fallen leaf, set it afloat in a babbling brook, and watch it float away into the great beyond. It’s tricky, this business of moving on. Regardless of what it is you’re trying to overcome, the past has a way of sneaking up behind you and climbing back up onto your shoulders, poised perfectly to whisper in your ear all the doubts you’ve been trying to put to bed. It hisses the ‘what ifs’ you haven’t yet thought of and snickers as you romanticize what has already been, even if what has already been was actually not all that great in the first place. I think it’s the clarity of all the good that we have today that makes moving on from the past possible. Being truly grateful for the wonderful people and things surrounding you makes it easier to let the things go that you have no business hanging onto. Maybe it’s the touch of a significant other. Or the smile on your child’s face. Or a random act of kindness from a stranger on the street. Good is all around us, if only we open our eyes to see it. Sometimes letting go isn’t just about moving past something. It’s about acceptance that what has been was meant for you at the time, and what is now is meant for you now. It’s being grateful for the past and all the lessons it brought with it. It’s looking in your own backyard and seeing that the grass across the fence in fact is not greener than your own. It’s knowing that clarity is a place that moves towards you, and sometimes you have to move towards it. It’s knowing that progress is never stationary, but it is also a force that cannot be stopped. My progress has sometimes moved at lightning speed. In other cases it’s taken its time. 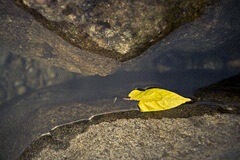 But regardless of how swiftly or gently the brook is flowing, I know I will see that little leaf float ever away. This entry was posted on Saturday, April 2nd, 2016 at 2:09 pm	and posted in Down The Rabbit Hole. You can follow any responses to this entry through the RSS 2.0 feed. Thank you, Jenni for painting something indelible on the wall of forever and for releasing hope and love, in the humble form of a little leaf, into the Endless River. Thank you Paul! You are one of the most beautiful souls I’ve ever had the honour of knowing. Thank you for your kind words and encouragement! Thank you so much Terry! It’s people like you who make sharing the tough things so worth it. Thank you for being a part of the journey!